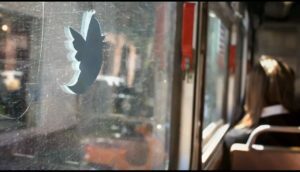 The Twitter bird icon plastered to a public bus window, from a short video about the micro-blogging platform's new interface. Do transportation agencies keep up with conversations in blogs and social media? The answer is generally yes, but it’s not so systematic. It’s likely an employee is checking Twitter updates occasionally, writing back when possible, expanding an agency’s social media presence and managing its image, but that’s about it. The surge of online information fed to city and state transportation agency representatives from local residents ranges in relevancy, from just a lot of second guessing (there’s the rants and the misinformation) to factual information and thoughtful input from experts and a knowledgeable and talented citizenry. do social media really help transit agencies respond to citizen needs and improve services? who are agencies hearing from? are transportation agencies analyzing who is saying what? It makes sense that transportation and urbanization compel a broad citizenry to engage, write and watchdog online. For urban dwellers, the results of transportation investments are tangible; we can see our dollars at work when it comes to infrastructure. And transportation directly impacts quality of life: the value of city real estate, the time it takes to get from one point to the other, health, road safety, the environment, etc. The ubiquity of blogging on transportation issues may also pivot around increased access to data. Schedules of buses and trains, population densities, traffic counts, bike accidents, transit ridership—all this information is now widely available and generally noncontroversial, specifically because of the openness of the internet. Urban planners and engineers, large city agencies and transportation providers have also shown a growing interest in social media. It seems like the raw availability of online information further drives public interest in the subject matter. Blogs written by regular citizens who track local transit and urban development issues exists in nearly every major city in the North America: Miami, Ottawa, Washington, D.C., New York City and Puebla, Mexico, to name a few examples. The trend is taking off elsewhere in the world, too. Some examples include a blog on transportation in India, a blog on urban development in Indonesia, and spin-offs of the Copenhagenize bike-related blog in Amsterdam, Lisbon, Munich and other cities. Transit agencies themselves have taken to blogging and social networking to expand their reach. Here on TheCityFix, we’ve written about Delhi’s traffic police using Facebook to fight dangerous driving; U.S. transportation departments crowdsourcing ideas for bikesharing locations and; and Johannesburg’s use of Twitter to organize a test ride of its new rail line. For these and other reasons, prominent research organizations like the Transportation Research Board have been investigating the potential of social media to increase ridership, reach new audiences, promote closer relationships with customers and communicate real-time information more efficiently. As people increasingly write, tweet, call and SMS (text) about transportation, can social media tools be systematically analyzed to figure what people are saying and who is saying what? In short, people want to know: How can social media engagement improve transit service and what has it done so far? John Lisle of the District Department of Transportation (DDOT) in Washington, D.C. explained how his agency (and others around the country) are employing the information of bloggers and other social media tools. DDOT uses social media on a case-by-case basis and more for immediate issues like service interruptions or road closures. Yet he is aware of the long-term implications of what the public is saying about DDOT’s service, so he reads hyper-local blogs like Greater Greater Washington. However, on an aggregate scale, DDOT is not attempting to formally track what the public is saying, he says. With social media, “people can gripe at you and communicate at you” Lisle says. And the tools “kind of speed everything up.” But there’s no scientific attempt to manage this constantly flowing stream of information. A more formal analysis could be useful. For example, monitoring the sheer number of “re-tweets” on Twitter or the number of comments on a particular blog might help push an agenda just as much a community meeting would. However, Lisle acts more as a communications conduit—rather than a research analyst—between social media users and DDOT and therefore can’t adequately track the full scope of public comments and engagement online. Of course, DDOT has made some adjustments to its services through the hand of social media and under the eye of progressive, business-minded DDOT Director Gabe Klein. The department has a blog and Twitter account. It has also embraced a new initiative to integrate data from non-emergency issues reported through SeeClickFix, an online mapping tool, into the Mayor’s Citywide Call Center. This open source data platform, running on Open311 standards, is an upgrade to the city’s previous phone-based 311 system, which allowed people to call in with non-emergency requests for assistance with city services and police matters. Transit agencies know that communicating through social media does not replace traditional forms of communication, such as neighborhood meetings. Lloyd Brown, communications director at the American Association of State Highway and Transportation Officials (AASHTO) echoes this sentiment. He thinks that despite the tremendous development of these online tools, they are merely accents to more formal processes that have been in place for over four decades. Plus, new media leave core segments of the urban population silent. The excluded groups, including the transit-dependent poor and elderly, make up a large share of agency ridership, so it’s important to take advantage of offline tools to improve access to information, as well. There’s no doubt the specialization and proliferation of blogs is exciting. It expands the debate and further democratizes the planning and public hearing process, but for the limited staff of transit agencies, there may be just too many voices of varying reliability to pay it serious mind. In the end, city planners and transportation agencies must remember to have a balanced approach to transportation and offer a range of choices to engage in communication with the public, despite often fielding stronger voices than others.